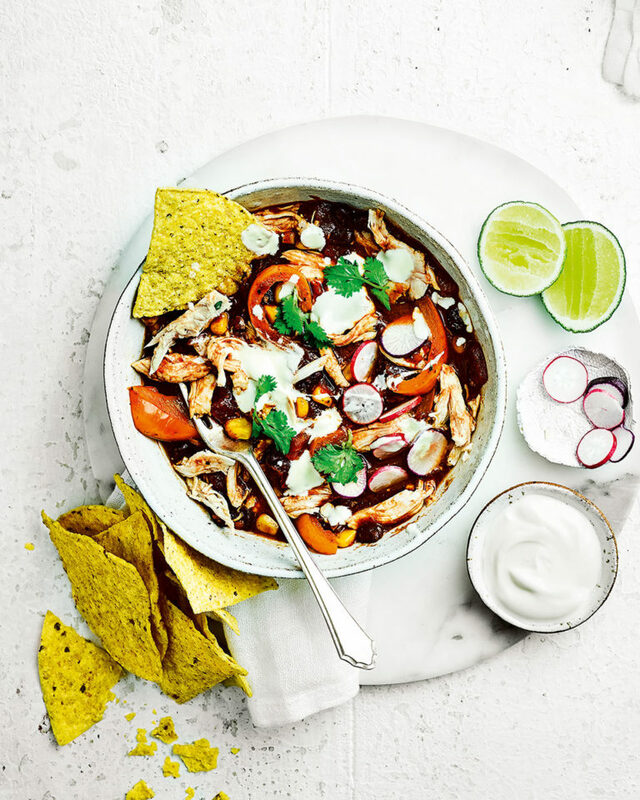 We’ve used a ready-roast chicken to cut down the cooking time of this Mexican stew recipe while still ensuring high quality flavour. Heat the oil in a large pan over a medium heat. Add the onion and fry, stirring, for 5 minutes. Add the fajita seasoning and continue to cook for 2 minutes. Add the orange pepper and fry for a further 5 minutes until just softened. Drain and rinse the black beans and sweetcorn, then add to the pan with the chopped tomatoes (rinse out each tomato tin with 100ml hot water and add to the pan too). Stir well and bring to a simmer, then cook for 10-15 minutes until slightly reduced. Remove the meat from the roast chicken and shred. Add most of the chicken to the stew, then season and stir to warm through. Divide the stew among 6 bowls. Top each with 1 tbsp soured cream, the remaining shredded chicken, a few sliced radishes, a squeeze of lime juice and a few fresh coriander leaves. Serve with tortilla chips to dip.